DiskSorter Server provides the ability classify specific types of files or file categories using an extensive set of file matching rules capable of matching files by the file name, extension, directory, file type, file size, creation, last modification or last access dates, etc. 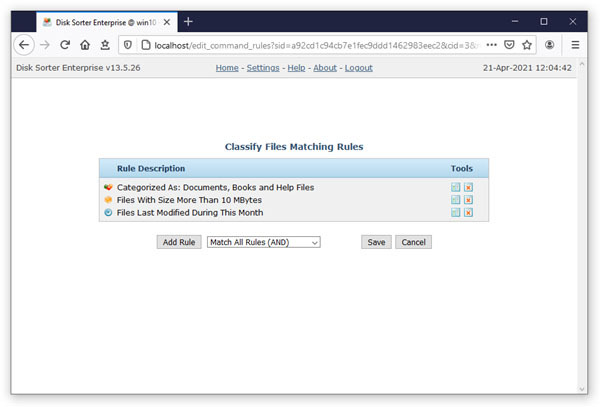 In order to add one or more file matching rules to a file classification command, open the required command, press the 'Rules' button and press the 'Add Rule' button. 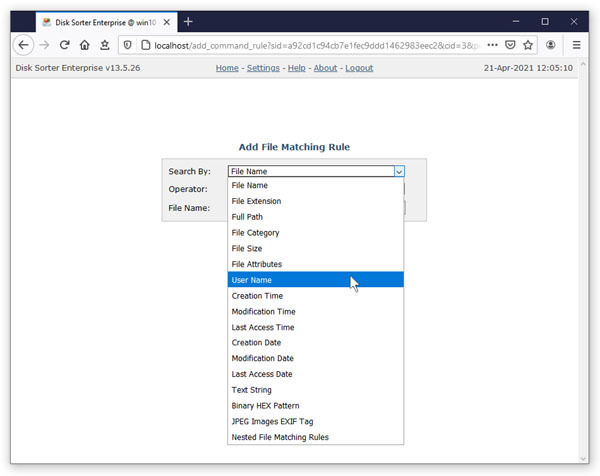 On the file matching rule page, select an appropriate rule type, select an operator, enter a rule value and press the 'Save' button. DiskSorter Server allows one to add an unlimited number of file matching rules to each disk space analysis command and apply the (AND) or (OR) logical operators. For example, the user is provided with the ability to classify all types of documents with the file size more than X MB that were modified during the last month. Finally, DiskSorter Server allows one to define multi-level, nested file matching rules with different sets of rules and logic operators on each level capable of precisely selecting the subset of files that should be processed.